The term “Cinque Terre” is used to describe an area of land, not one place, so if you search for train schedules for the “Cinque Terre” you won’t find one. 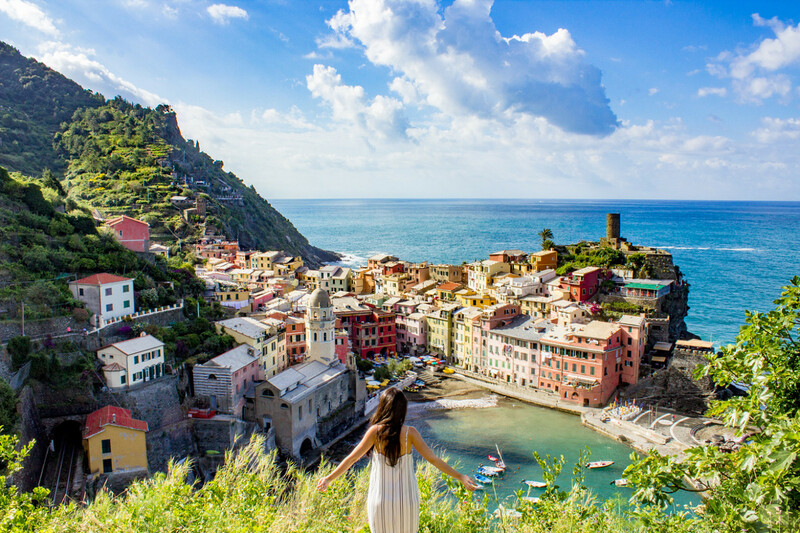 It literally means “five lands,” referring to the five beautiful villages of Riomaggiore, Manarola, Corniglia, Vernazza and Monterosso al Mare. The area has been a Unesco World Heritage Site since 1997, meaning there’s been a big influx of tourism over the past decade. People come from all the world to traverse its tortuous paths through the cliffsides from town to town, but thankfully the place still maintains an old world charm. As you can see from the map below, the 5 towns are really close to each other, so it is easy to visit the whole area in just a couple of days. I’d totally spend a year here if I could, and let’s be honest, you want way more than 72-hours in the Cinque Terre, but if you’re pushed for time, you could easily cover a highlights tour in three days. For this sake, I have decided to compress the area’s cute little towns into one cute little guide. This is not the sort of place to race around with a checklist of sites and “must do” activities, so this won’t be that type of guide. I’d highly encourage you to spend time just chillaxing and enjoying the little things. However, this can totally be an active vacation if you want – and it should, because lord knows how much pasta and gelato you’ve been eating! Nearby airports are Milan, Florence, Bologna, Pisa, Genova. 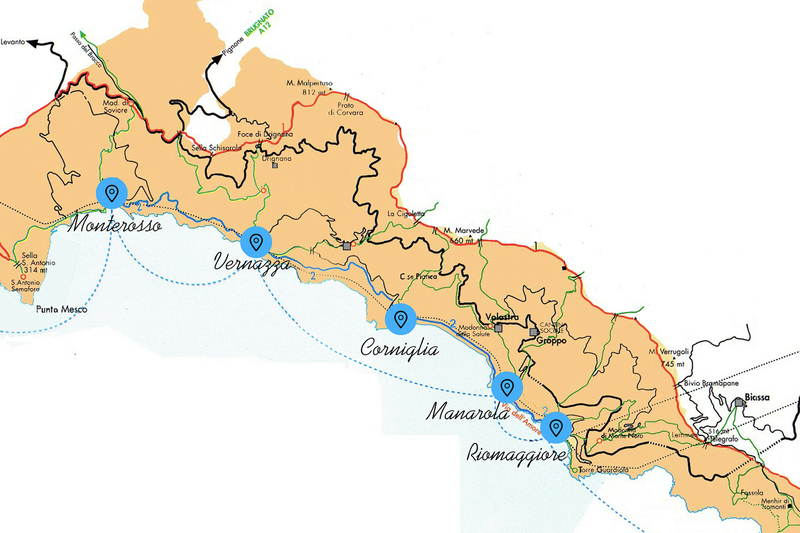 From any of these airports, you can reach the Cinque Terre and Levanto by train or car. No doubt, Cinque Terre is best reached by train. The closest airport is Pisa and it’s about a 1 1/2 hour train ride. Milan Malpensa is the largest airport in Northern Italy and is 280 km away. Direct trains travel between Milan Central station and Monterosso several times per day, and travel time is approximately 3 hours. 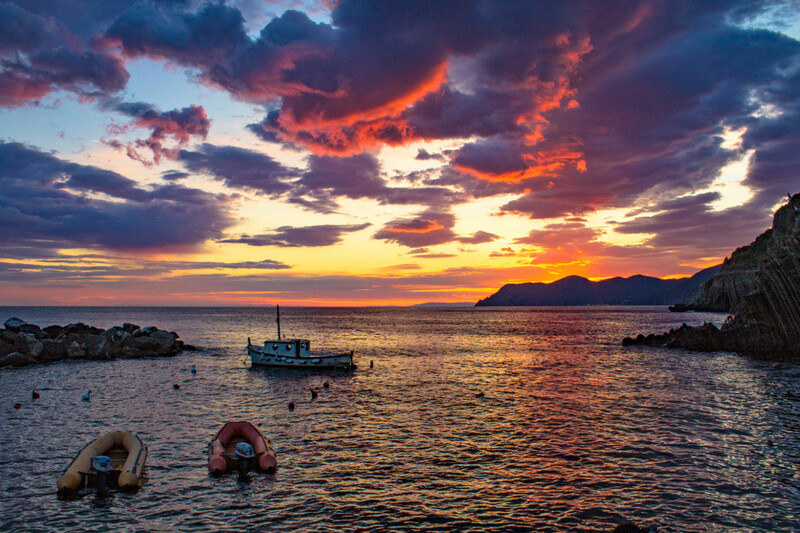 Traveling from Rome, you would take the train to La Spezia Centrale, a town close to Cinque Terre. You can check on Trenitalia.com for finding the combination of trains more convenient for you. If you are arriving by car, it’s highly suggested to stay in the neighboring towns of the 5 Terre region, such as Levanto or La Spezia, as you will have a much easier time finding parking. There are basically three ways to move from one village to another: you either walk, take the train or the boat. The walking trail is 12 kilometers and runs along the coast through all five villages from Monterosso in the north to Riomaggiore in the south. Even if you’ve never hiked before, it’d be sacrilege to skip the walking trails that wind their way along this gorgeous coastline. The train is a very easy and convenient way to get from village to village, and runs approximately three times an hour. Each of the five villages has small train stations that you can use, and you will be able to purchase your train tickets from the train station easily. The cost of the single train ticket is 4€. The boat runs less frequently, but I highly recommend taking it at least once, as the view from the sea gives you the possibility to appreciate the colorful buildings against the neutral backdrop of the hills. The Cinque Terre Card bundles the price of the trains between the five villages (but not ferries) and a hiking day-pass. A 1-day pass is 16 € and a 2-day pass is 29 €. If you are thinking whether you should get the card or not, ask yourself: will you be hiking? Will you be taking the train at least three times in a day? If yes, buy the Card. 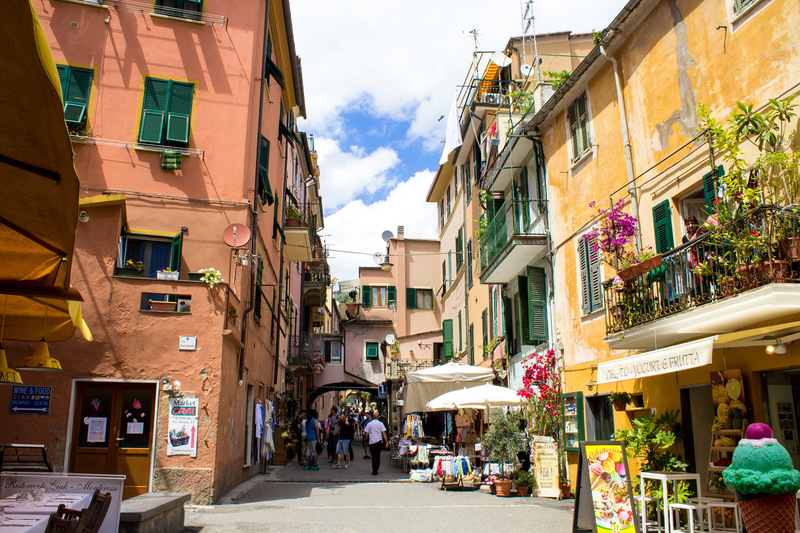 One of the most important considerations when traveling to the Cinque Terre is what town to make your home base. However, don’t get overly caught up in which village to stay in – they are all wonderful, and they are close, really close. Like, BFF. If you want that postcard pretty view, then Manarola, Riomaggiore and Vernazza is likely where you’ll like most. 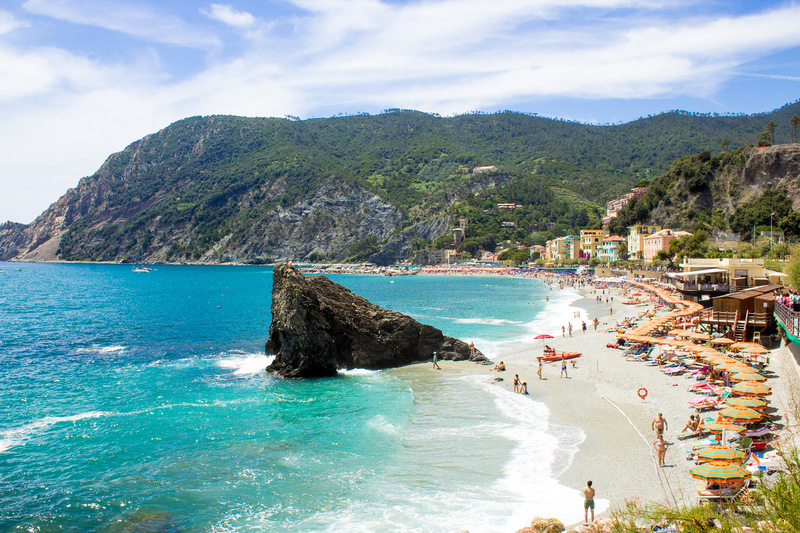 If you want to stay somewhere with a beach and with a resort feel, Monterosso will be the best one for you. Corniglia is very pretty but note that getting there requires you to take a little hike of 365 steps upon exiting the train station before you reach the town. Alternatives include staying in Levanto (which comes with an equally gorgeous beach) and La Spezia – where it is significantly cheaper and more convenient without all the crazy climbing stuff. The only hassle is the train frequency – there are mostly only two trains every hour. My 3-days itinerary for the Cinque Terre uses Monterosso as the home base, but this is only a suggestion, purely based on my experience and meant to offer a good idea of how much you can fit into the time you have. It can be totally redesigned, starting and ending from any of the towns in the Cinque Terre. Benvenuto alle Cinque Terre! You’ll likely be arriving tired, probably hungry, so let’s not plan too much for today. I’d suggest finding a place on the promenade and watching the sunset with a glass of Prosecco. Or you could just laze on the beach all day. Sound more like you? Yep, me too. Monterosso is the definitely the biggest kid in the family. Her structure isn’t as vertical as her other sisters’ and is made up of an old town, a new town, lots of sandy beaches, some larger hotels and a long seaside promenade. 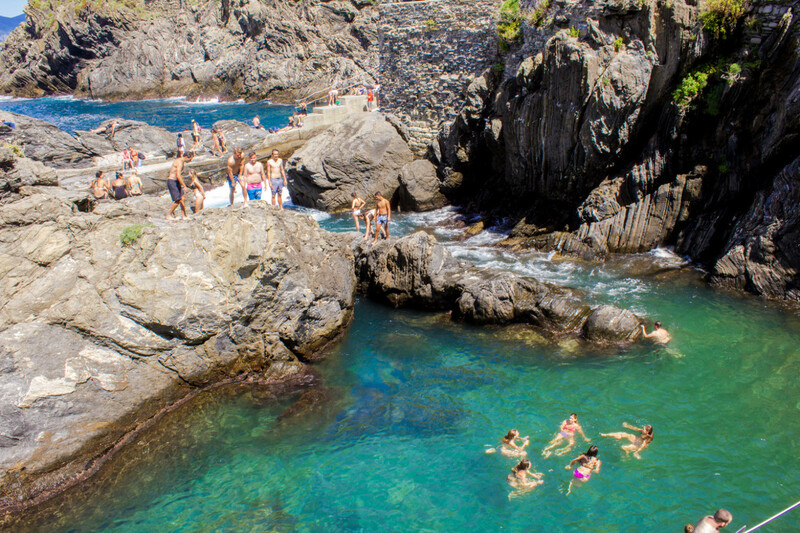 In warmer weather, your first afternoon in the Cinque Terre is the perfect excuse to slip into your swimsuit and wash off all the travel stress with a dip in the sea. The beach in Monterosso is the largest and most typical, but there are smaller and rockier beaches in some of the other towns. For the most part, I’d recommend spending whatever time you have on your first day just enjoying the view, exploring the town you’ll be based in, soaking in the atmosphere, and figuring out where you’ll eat dinner that night. It’s also a good idea to sort out the necessary Cinque Terre Card for the following days. Dedicate the first part of your second day to Vernazza, the coast’s most picturesque destination. Fuel up with a quick breakfast – aka cornetto and cappuccino – then spend the morning exploring the pretty town. To get to Vernazza you can either start the hiking trail from Monterosso (it’ll take one hour and a half) or simply hop on the train from Monterosso (it’ll take 1 minute, easy-breezy). 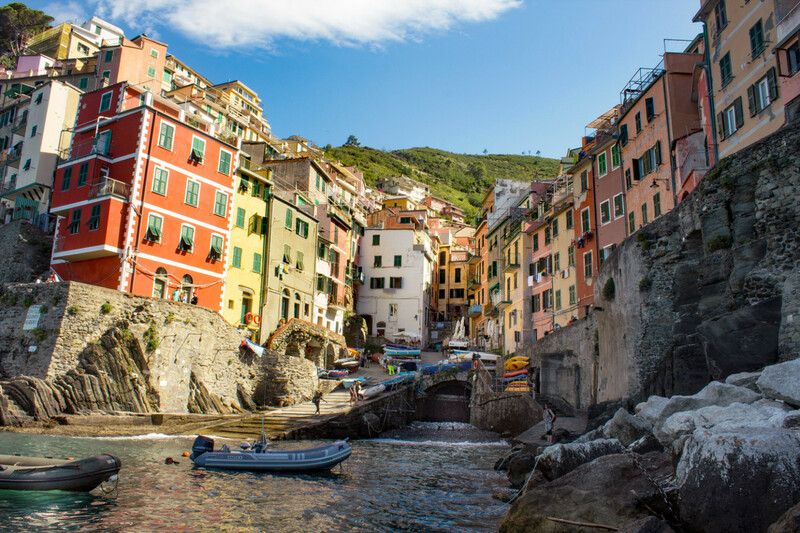 The shot above is on the cover of countless European guidebooks and is considered the face of Cinque Terre. Vernazza is a one-street town with a church built on the water. The wide main street is filled with shops, restaurants and, of course, tourists! Must-see are the castle, the remains of the old wall that protected against pirates, a gorgeous waterfront piazza and a natural harbor with a super tiny spit of sand. 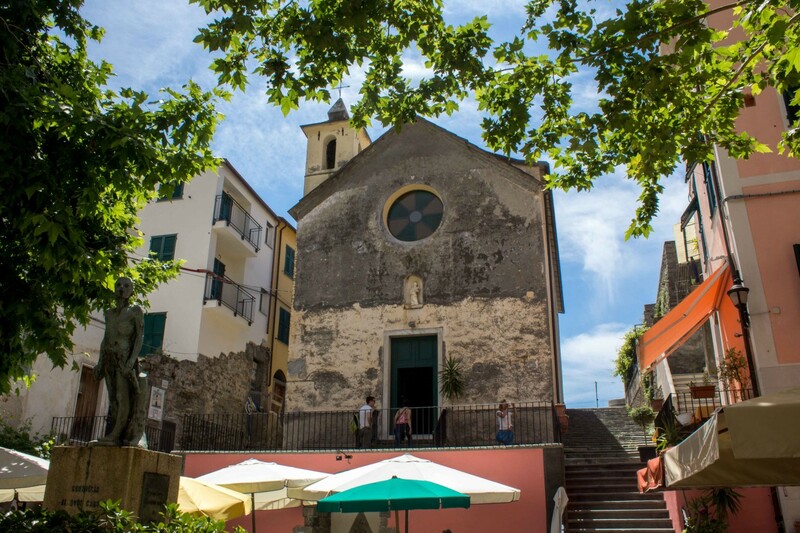 Dedicate the afternoon to Corniglia, the only village without a harbor. To get there you can either start the hiking trail from Vernazza (one hour and 15 minutes) or simply hop on the train from Vernazza. Lacking a harbor and therefore tourists, the village feels well preserved in some sort dreamy Italian time capsule. The Baroque-styled Church of San Pietro and the ruins of a Genoise fortification located on the cliff are the sights not to be missed. Corniglia’s built far above the ocean on the cliffs and it is much calmer than the other villages, so if you need a moment away from the crowds, get there asap. It is indeed a long walk up, so you can totally give yourself a double-scoop gelato treat when having reached the little village. And yes, Gelato in Italy really is the cat’s pyjamas. 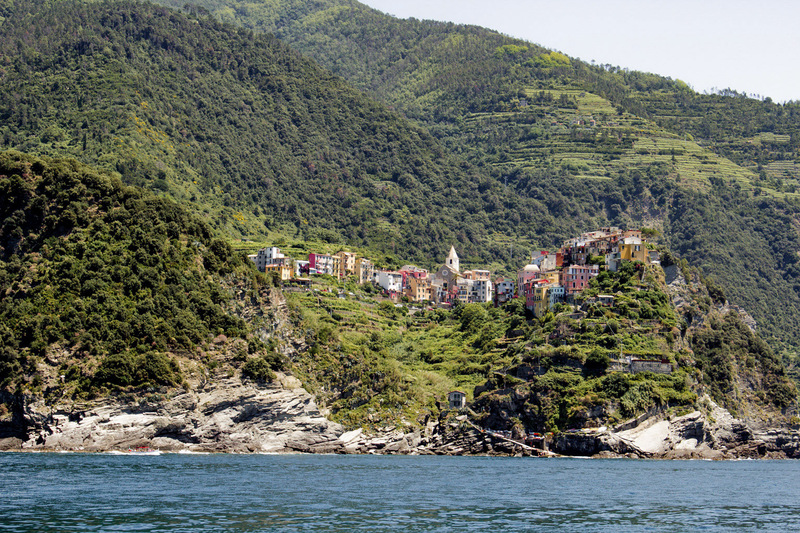 On your third and last day, spend the morning in Manarola. A gorgeous little harbor below and beautiful wine vineyards above, Manarola is by far my favorite village, the one that originated my love affair with the Cinque Terre in the first place. A darling street cuts right through the village, famous for the rainbow colored homes sitting on a cliff above crystal clear waters and a small harbor where you can swim. Once you dry off, there are plenty of historic churches to visit, as well as the ancient 8thcentury bastion. Finally, don’t you dare leave Manarola without a big fat slice of pesto focaccia, one of the specialities of this area. Remember, if you haven’t had five minutes alone with a square of Ligurian focaccia, you haven’t experienced bread nirvana. 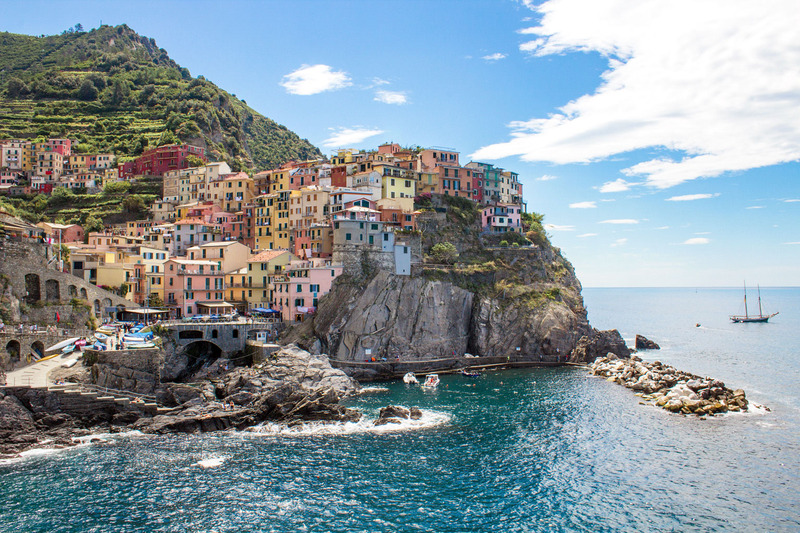 Say Arrivederci to Manarola and head to Riomaggiore, perhaps the most authentic village. To get there from Manarola, you can either take the train or walk on “Via Dell’Amore” which translates to the “street of love.” The course if flat and pave, and will only take about 30 minutes. [*Note: unfortunately, right now the path is closed for construction due to the unfortunate landslides that occurred a few years ago]. A bit rougher around the edges, Riomaggiore is the largest village and sprawls along the steep hillsides. It has one main street, a harbor, a rocky beach, a castle and a church. The village is famous for its bars and restaurants, and offers some of the freshest seafood in the area. It has two parts to the village, divided by railway line. On the bottom part is a rocky beach with spectacular views of the Mediterranean Sea. From here you can also take incredible photos of the colorful houses on the hillside above. This is the best, best spot in Cinque Terre to watch the sunset, and ya’ll know I can’t resist a good sunset photo. There you go! 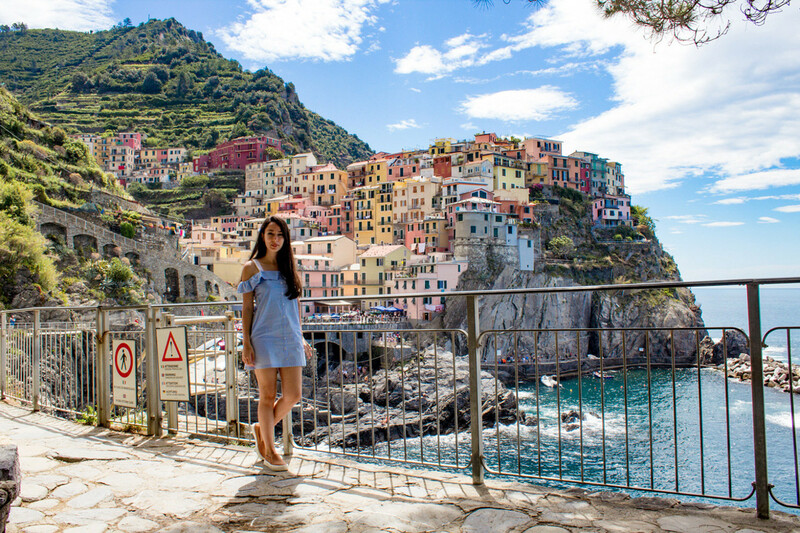 72 hours in Cinque Terre that will have you smiling for a long, long time. My final travel tips at this point are simple: get lost and eat everything in sight, literally. Also wine it up, because they make their own and it’s divine. Besides, a dip in the Mediterranean cures every hangover. Finally, mingle with the locals, it’s the best way to get a sense of a place. No matter what happens, I can guarantee you won’t leave this place without a big smile on your face (and a few extra pounds!). 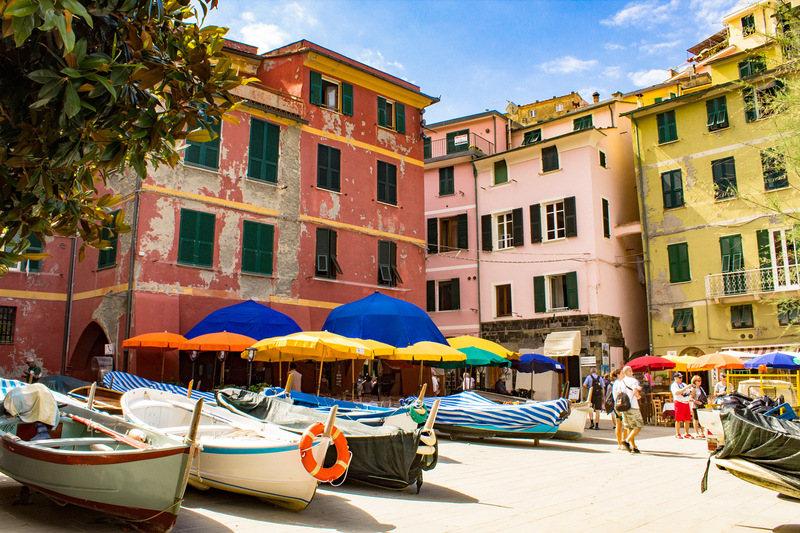 Which is your favorite Cinque Terre town and why?